Do you remember the story of the very hungry caterpillar, who was so hungry he was set on devouring every food-related object in his path? Although the protagonist this time isn't exactly set to transform into a beautiful butterfly at the end, this worm needs your help to eat, eat, eat, and grow in length. But this word of gluttony also has hazards such as spikes, gravity, and a snake-like twist of accidentally eating your own tail! 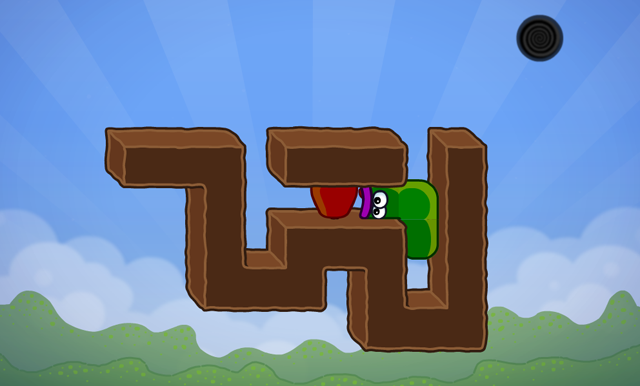 Can you navigate the worm successfully through all of the levels? You'll use the arrow keys to navigate your worm companion through the levels and to the exit portal. You'd best be forewarned though - this game can be harder than it first appears and can leaving you scratching your head...if worms had hands to do so, at any rate. Each time you eat an apple, your worm will grow by one segment, and it has the remarkable property that it can cling to a surface, even if the rest of its body is hanging off. It seems either to be in violation of physics or to have some amazing suction cup feet, but watch out - go one tile too far and your whole body will lose contact, and nothing can save you from sliding down vertically! Sometimes the apples will act as decoys, and other times you will have to do some body-bending contortions to both nab the length boost you need to complete the level and avoid self-consumption of your own tail. Enjoy the game, and bon apple-tite! Maybe it's my device, but all links posted here lead me back to the JayIsGames page. Hummm strange works well for me. A slightly hinty text walkthrough for when you get tired of that real-life head-scratching. Level titles in the spoilers are given by me, of course. Crawl: This level introduces movement. Just use the arrow keys to move to the exit. Notice that you don't have to climb back down because gravity does it for you. Conversely, parts of you can levitate as long as any part is supported. Feed: This level introduces growth. The apple is necessary to reach the exit. Gap: This level has a horizontal obstacle instead of a vertical one. To cross the gap, you don't just need to be four long. You also need to be ______. Now you can cross the gap safely. Trap: There's many ways to get stuck! You can't actually leave through the gap nearest the exit. Which means that you have to return the way you came. Does your tail get in the way? You need to avoid the apple until your tail isn't blocking the left exit. Now you can safely take the apple and climb up. And of course you can cross the small gap. As in the previous level, you need to avoid the apple to leave yourself space. All you need to do now is hang down next to the exit and go through it. Double dip: Twice as many dead ends! You need to enter the tunnel and grab the apple. The only entrance that works is the ____ entrance. Then leave through the left side and complete the level. Leap: The apple is even more difficult to reach. As you know from level 3, you can only get this apple safely by crossing the gap in a specific way. There's just enough space for a U-turn. Cross the gap and finish the level. Reversible: Try a different approach. You can't grab the apple while crossing over to the right. What if it were the other way? Now finish the level by crossing the gap and wrapping around the right edge. Weight: Gravity adds a twist to an old puzzle. As before, start by wrapping yourself around near the apple. Restraint: Good thing that hole in the floor is covered. You can't eat the apple from the left, because your tail blocks your escape. …and then continue to the left. This means that your tail must be on the right! Enter the hole face down and immediately go right, then turn around and pick up the apple. Movable: This level introduces push (gray) blocks. Push the block from left to right until it's under the exit, and then climb up. Long: That exit's really far out. The apple is a trap. Use the push block to make it safe. Tall: That push block's really high up! The apple is a trap. You're going to have to reach the push block without it. Climb on the apple to reach and push the block. Push the block in position and take the apple. Deep: Those pits are really deep! Now you can push the block and leave. Pusher: Bring the block to new places. Now you can reach the exit. Double: Let's see how you deal with two blocks. Having trouble pushing a block away from an edge? It helps to plan your moves ahead. Turn around and move the block to get the apple. Position yourself so you can push the block back. Hoard: This time, you need the blocks to make your descent. You'll need to go around the top block to push it down, but that means you have to climb really high. Sound familiar? First, push the left block to the edge. This lets you climb onto the apple and around the top block. Push it down! Grab the apple and push the other block down. You're all ready to leave! Cramped: Can you get the blocks to stack? You essentially have two paths to take in the pit, and the order that you do them matters. …LLLUR… and you're free to leave. Sparse: There's almost nowhere to stand! …that dooms you to fall. So don't do it! Cross over the apple to the other side where you can push the blocks. Push a block, cross back to the left, push the other block, and leave. Divider: A tricky level, even if the tricks are old. You need both blocks in the bottom right, which means freeing both of them. The pit under the left ledge indicates that the left block is more difficult. Solve that one first. You can't push two blocks at once. Don't let them touch horizontally. You need to leave the apple so you can crawl around the left block. Now you need to eat the apple and push the block right when it drops. But don't drop this block, because you need it to get the other block. You can't push the top block first (or they'll get stuck). Push the bottom block. Push the blocks in and climb to the end. Hurt: After 20 levels, we finally get spikes. The rest of your body will soon be unsupported, so put your head on the ground. Hostile: There's less safe ground here than you'd like. Remember from level 5 that you can only get this apple from the left or right. Which is correct? Eat the apple from the left side. The spike prevents you from climbing the right ledge, so get there from the left ledge instead. One way: What must you do? What mustn't you? You need that apple, and there's only one way to reach it. Climb to the top right of the level. Then grab the apple from above. And crawl your way to the end. Smile: It's not that difficult. The apple gives you a chance to move your tail away from those spikes. Go down and then up, and then? Tiny: A nice and short challenge. Work backwards to figure out how to fall without failing. Trace out a tetris piece which fits over the spike. Drop: The story of a block and three spikes. Where does that block need to be? Push the block over so it doesn't get trapped on this spike. Now you need to get the apple safely. Send the block to the right spikes so you can leave. Pyramid: Do you go up first, or down? If you plot your half through the lower half of the level, you'll find that it's not passable yet. What do you need to do? Climb up and push the block down towards the right. Then push the block in the pit and work your way through. Finish the level as usual. Turnaround: Simple level with a clever twist. Grab the apple and push the block as usual. Going up eventually puts you in spikes. So avoid the block while you turn around on the right, and then the left. Crossing: There's a long way to go. Where does the block go, and how do you get it there? Climb to the top so you can push the block right. And then push the block right again. Find a safe spot to crawl to the apple, and then you can finish. Tower: The final challenge of the game. This paradise of apples is also a purgatory of spikes! The bottom two apples must be collected last. Let the right block drop as you pick up the top two apples. Adjust youself so you can pass to the left, leaving a space to push the other block right. Pass over the stack to the right ledge, and make sure you rest firmly on it. Then grab the last two apples by going around the bottom. Mash buttons on the end screen to escape this turn-based platformer hell. This is a pretty shameless ripoff of Snakebird (minus the great level design). Even the character animations are similar. Level 19 WITH apple walkthrough. Stack blocks on left side first. Get to far right side. Stack the stones to left side. Get apple and cross gap then back to exit.